USB gadgets as far as the eye can see. Sure you can just leave your iPhone 7 Plus without a case but if you want to give it a more unique and personalized look then a case like this is what you want. 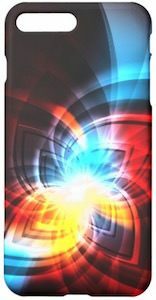 This iPhone case has a black background but on that, in bright colors you can find a fractal pattern that kinda looks like a flower (to me). The case is made for the 7 Plus so all the ports are accessible and no hole for a headphone jack but lots of room for the camera. You can get this iPhone case in a glossy or matte finish. Come take a better look at this iPhone 7 Plus Fractal Pattern Case. Copyright © Cool Usb Toys. Design by Helemaal Niet!, Powered by WordPress.